Politics aside, am I the only person on Earth who just wants to give her a carrot and watch her go to town? Sorry to distract, but this girl stepped right out of bugs' idle thoughts. Beep beep, that's all folks! And yet it is clear that the amendment was not passed to "kick FDR out of office" nor to "prevent FDR from being elected a 4th term"
This is physically impossible unless amendments have the ability to retroactively transcend time and space. Are alleging this is the case here? AOC is a bonafide moron. I weep for my once great nation. 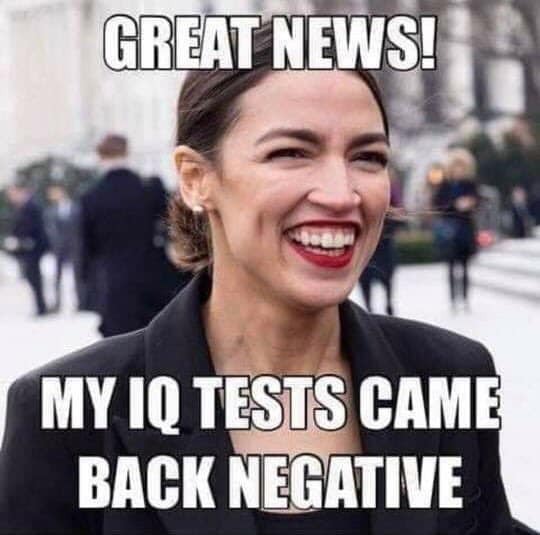 Thanks to moron law makers like AOC, this country has gotten PROGRESSIVEly dumber and makes a whole heck of a lot less sense over the years. We don't need low-IQ idiots like this anywhere near the law or public office. She's a sure win for the Democratic party Presidential primary once she's old enough to actually enter it. Her teeth are disturbing. Mr. Ed laughs at her. There are those Looney Tunes chompers! Good god this woman is stupid. She may not be as dumb as we may think. The Democrats have been tipping their hands as of late. Get rid of the Electoral College so that power can be consolidated from a few coastal states and large cities. The rest of the country can go to hell and serve as their tax cows and should have no say in their future. Kill term limits so that next time they have power they can complete the plan of replacing military leadership, complete control of government agencies like the IRS, FBI, DOJ, FCC, etc to become a hammer against any political opponents / resistance. With no term limits and no electoral college they will complete the task of complete control with no fear of ever loosing their positions or experiencing setbacks. Fully agree that is clearly the Dems' plan. Obama's weaponization of the IRS, DoJ , FBI and CIA is proof enough of that. Their big flaw is that the Dems have so far failed to weaponize the military, thank God ! Just going by what she says, she craves power, her Green Deal is an authoritarian dream, her arrogance is off the chart. Because she grew up thinking she can have everything she wants. you can't think of anyone else who fits that? anyone? you all are so triggered by this girl, it's fun. Unlike starry-eyed low iQ libtards like you and AOC, we can see that her cocktail-waitress-brain "plans" would lead to economic collapse and mass starvation in the US, just as similar dingbats have caused Venezuela, despite having the largest oil deposits in the world after Saudi Arabia, to STARVE.